OSAKA - With the arrival of flu season, Osaka University Hospital on Tuesday introduced a unique way to keep the virus at bay, deploying a hand sanitizer dispenser in the shape of a famous Roman sculpture. 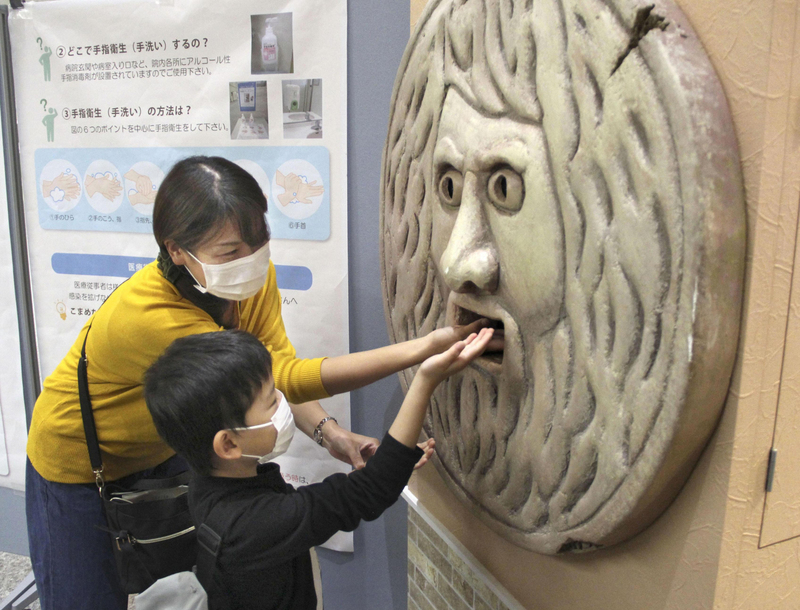 Playing on the legend of the ancient marble “Bocca della Verita” in Rome, the hospital set up a replica of the “Mouth of Truth” that automatically dispenses liquid sanitizer when a hand enters its mouth. The Italian carving, so the legend goes, bites down on a liar that dares tempt fate by placing their hand in its mouth. 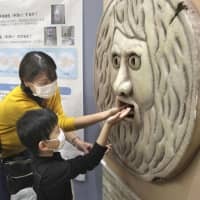 Patients and visitors will be able to take fate into their own hands with the hospital’s Mouth of Truth until Nov. 16. The hospital said it did not think the usual tactics to increase people’s awareness about the flu were working and decided to pique people’s interest by offering them something very different. Once infected by the virus, symptoms of patients with a weakened immune system can turn serious, so it is critical that the hospital has strong defenses to keep the influenza virus out, said Daiichi Morii, a doctor with the hospital’s Infection Control Team, which planned the installation.